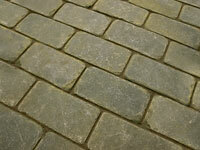 Reclaimed granite setts are a wonderful way of creating driveways, patios, pathways or features. Extremely versatile in their uses granite setts will lend themselves to most applications and can withstand a high degree of traffic. 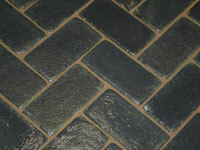 Granite setts can be a very fashionable alternative to block paving. Granite will withstand a lot more wear and tear than the equivalent concrete products, and the lovely colouring found in natural granite cannot be truly re created with imitation products. You can see above when used for a driveway, the possibilities are almost endless. Available in different sizes and different natural colours. Reclaimed granite setts are surprisingly cost effective as a form of paving material especially in areas of high demand, such as driveways. Examples of reclaimed granite setts. 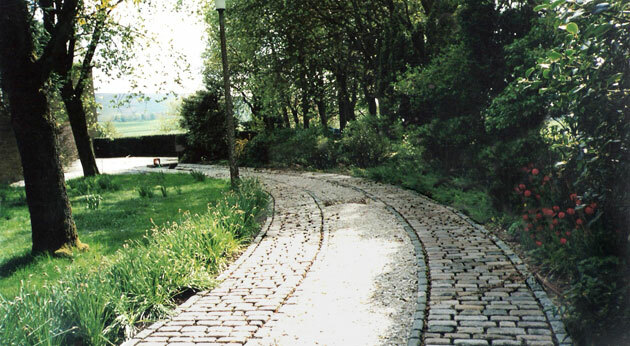 Below are some examples of reclaimed granite setts. Bingley Stone offer a location service for granite setts. 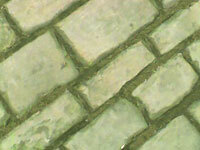 If you have a specific size and colour in mind Bingley Stone will endeavor to source the setts for you. The illustrations below are intended to aid this process by giving an indication of the range of colours and sizes usually available. Granite setts can be grouped loosely into three different size groups. These are outlined below. What we call misshaped setts vary in size and shape. Becoming ever more scarce in recent times. Some shipments of granite setts will have very similar size setts throughout. Other shipments will vary in size. Please note: The sizes quoted above are intended to give an indication of what is usually available. Sizes will vary from batch to batch. Please confirm details of what is available at the time of ordering. Granite can reveal itself in many different colours. Granite has been quarried from many regions of the U. K. and also other countries around the world. The result of this is that we now have a vast array of reclaimed granite setts in different sizes and colours. Below are some illustrations to show the different colours that are generally found. Grey granite will vary from light to mid grey, some shipments can be uniform in colour, others will have a spread of shades from light to dark. Pink granite can be more scarce than the grey or blue. The pink setts can vary from almost brown to almost grey. The subtle pinkish tones to this granite make it a very popular choice. A combination of colours of granite is quite common. Sometimes just blues and greys or pinks with greys but sometimes a complete mix of colours, even sizes. Please Note: Colours may vary due to your monitor & printer settings.